On the final day of the Social Media Study Tour we again started off with a workshop, this time with David Harris (@physicsdavid). Based on his background as a scientist and science journalist we worked on concrete examples from our respective institutions adopting David's methodology on planning a social media campaign. One of his key messages was to define communications goals and its audience and messages first before thinking of how social media - besides any other media - might help. The Mobile Evangelist David Todd Small introduced us to Blackboard's mobile solutions for universities. Among others, iStanford was built on Blackboard's platform. The App does not only interact with services but with functions of the device as well: E.g., direct access to email, the phone, GPS, integration of realtime info of the bus transit system, realtime and geo info about printers on campus, and others. For the future David announced augmented reality applications. 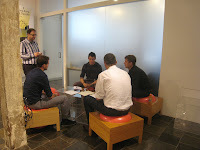 A debriefing at Swisnexx and a farewell dinner concluded the Social Media Study Tour. from Swissnex SF for organizing this great study tour!